Defined by its circular showerhead, the PAVO Series Outdoor Showers offers a robust yet refreshing shower. Measuring at over 10 inches in diameter, the PAVO gives excellent coverage from head to toe. The showerhead is individually handmade with precision machined nozzles and custom handle gives you total control over the intensity of your shower. 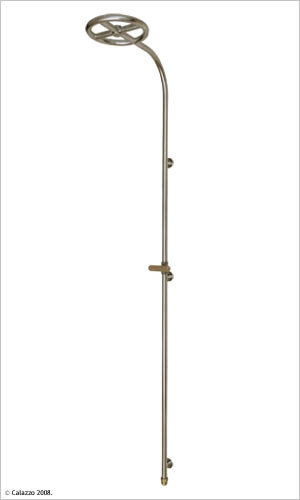 This shower is designed to mount easily to most vertical walls. An adapter is included for connection with a standard garden hose. 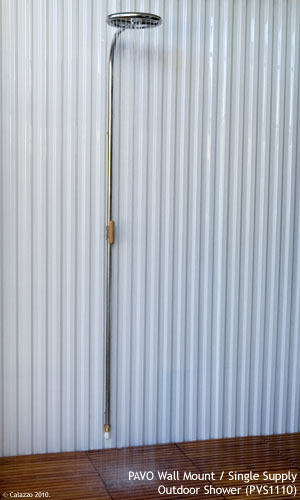 All 316 (Marine Grade) Stainless Steel construction for outdoor durability. Features: - Custom PAVO showerhead. - Available with White Plastic or Teak Handle - 316 (Marine Grade) Stainless Steel construction and hardware for durability and corrosion resistance - 1 inch diameter thick walled body. - Designed specifically for the outdoor environment; ideal for beach or pool. - 316 Stainless Steel WOG rated ball valves. - Mounts easily to most vertical surfaces. - Commercial Quality design and construction. - Single supply feed designed for connection to cold or pre-mixed warm water source. - Inlet sized for 3/4" pipe thread or use supplied brass adapter for connection with standard garden hose. - Teak tiles shown in picture NOT included.